With such a large population, India naturally also has a high number of vehicles on the road. As of March 2015, there were 154.3 million two-wheelers registered. Out of this, about 153 million have been registered only in the past 20 years. The number is ever-increasing and poses dangers to anyone on the road. The chances of accidents increase as the number of vehicles increase. Moreover, when an accident occurs, people are already in a bad mood due to the stress of traffic, and this results in fights and hassles trying to get one or the other to pay up for the damages. To reduce incidents like this, the Government of India made it mandatory for every vehicle owner to have an insurance policy that covers at least third-party liabilities. There are a number of insurance companies that provide insurance plans for two-wheelers in Nashik. To find the most suitable plan, it is important for one to compare different policies, do a little bit of research and opt for the plan that fits their budget and needs. Premiums for each plan will vary depending on the sum insured, the benefits of the policy, the age of the vehicle, accident history and so on. Some of the popular insurance companies in Nashik that offer motor insurance for two-wheelers have been listed below. Cashless networks bode well for both the insurance company and the customer. There are plenty of benefits for all parties involved as the turnaround time and hassle is reduced significantly. Quick Settlements - The settlement of the bill is handled between the insurance provider and the garage. The customer doesn’t have to pay the bill, then collect the documents and file for a reimbursement. Minimal Hassle - With cashless claims, the customer can contact the insurance company through the customer care. Once the claim is approved, the garage and the insurer will handle the rest between themselves. Direct Bill Settlement - With cashless settlements, the customer only has to pay for anything that is not covered under the insurance policy. The rest of the bill will be directly paid for by the insurance company. This reduces the financial burden on the customer as well. There are a number of factors that could affect your two-wheeler insurance. The benefits you receive versus the premium you pay for it could be in your favour if you do your own research to ensure you opt for the most suitable policy. There are a few important things to bear in mind while purchasing an insurance policy for your bike. Cost of the plan - The cost of the plan is the premium that needs to be paid, usually on an annual basis. Compare different premium amounts, premium payment frequencies and terms. Generally, for a two-wheeler policy, you will be required to pay a single premium for an annual policy term. 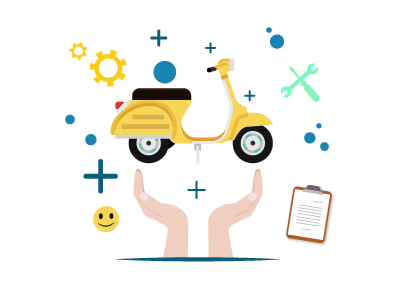 Financial Coverage - With two-wheeler insurance, there are two options available: liability-only policy or a comprehensive package. With a third-party liability policy, only damages, injury and death caused to a third party will be covered. If you choose a comprehensive package, then you will also be covered for own damages. Also, opt for an adequate sum assured. Cashless Claims - With the option of cashless claims, customers can have peace of mind knowing that they will not need to scramble for finances to clear the cost of repairs. The insurance company will settle the bill directly with little involvement from the customer. Policy Terms - Terms available on two-wheeler insurance are usually between 1 year and 3 years. When you opt for a longer term, you will be protected against rising premiums on third-party insurance as declared by the IRDAI from time to time. Deductibles - Deductible is the amount you will have to pay in case of a claim. A lower deductible will increase your premium, while a higher deductible will reduce it. If you choose a 20% deductible, the insurance company will pay only 80% of the insurance claim. If you want to sell your bike, then there are certain legal procedures that must be met. It is extremely important to transfer the ownership name of the vehicle to the new owner. This ensures that you are not legally accountable for any liabilities that may arise in connection with the bike in the future. You can do this paying a visit to the Regional Transport Authority (RTO). You can then apply for a No Objection Certificate (NOC). They will make the transfer. Inform the insurance provider of the sale of the bike. Make a request to transfer the name of the policy to the new owner. The insurance provider will verify details with the new owner to ensure he meets the eligibility requirements. Documentation will have to be submitted by the new owner. If you transfer your insurance policy, you will retain your NCB, while reducing the hassle of closing the policy.